"Two Fat Lardies. 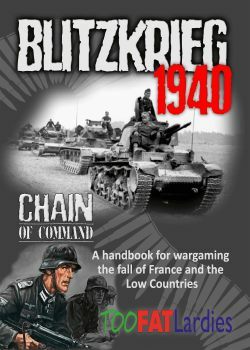 This 124 page handbook provides a comprehensive coverage of the campaign in France and the Low Countries in 1940. Included is an historical account of the campaign in the West, as well as whole raft of new rules to cover the events of that summer. New theatre specific rules include Assault boats and river crossings, parachute drops, glider landings, bicycles, horse mounted troops and motorcycles"